Where to Play The Dark Knight Rises for Real Money? Tie-in slots to the biggest Hollywood superhero slots aren’t a novelty in any sense. More often than not, they take symbols and imagery from their adaptees in order to capture the feel and atmosphere of the film. However, it really is quite the feat to accurately replicate the public response to a film as well. The Dark Knight Rises was a pretty divisive conclusion to Christopher Nolan’s Dark Knight trilogy. 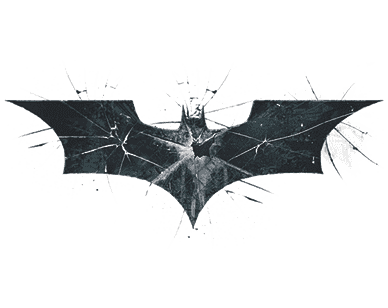 One of Batman’s more serious and grim appearances on the big screen, The Dark Knight Rises angered many fans for various reasons, while others thought of it as a fitting ending to the series. 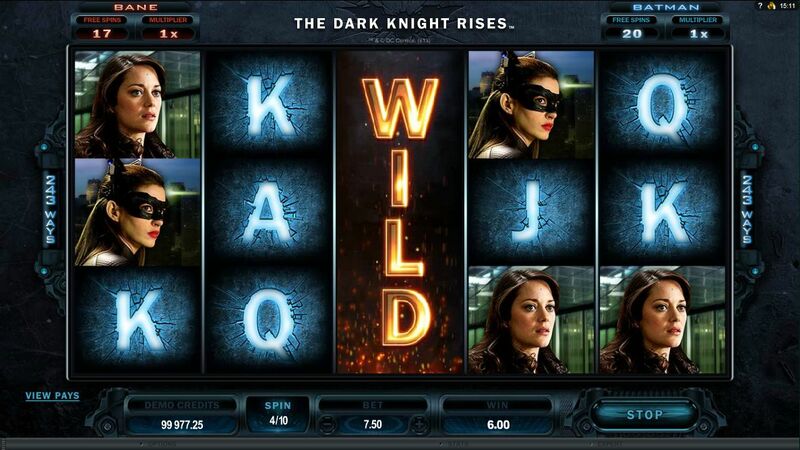 Microgaming’s Dark Knight Rises slot has gotten an eerily similar reception to the film. Some love it, some not so much. But what about this slot makes it so divisive? 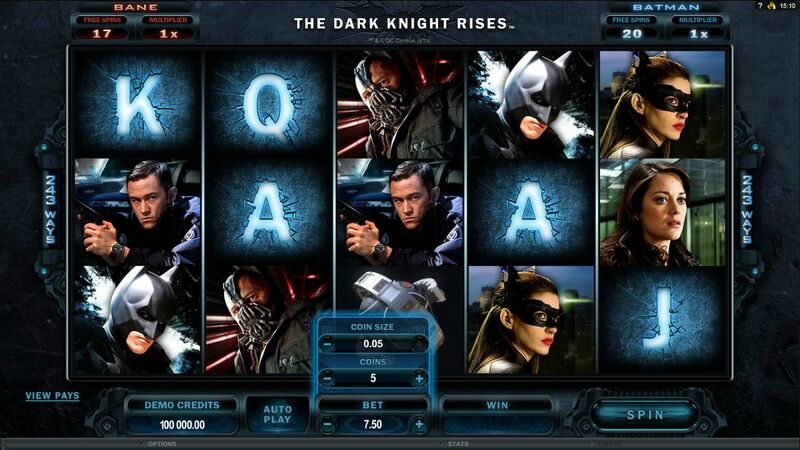 How to Play The Dark Knight Rises Casino Game? 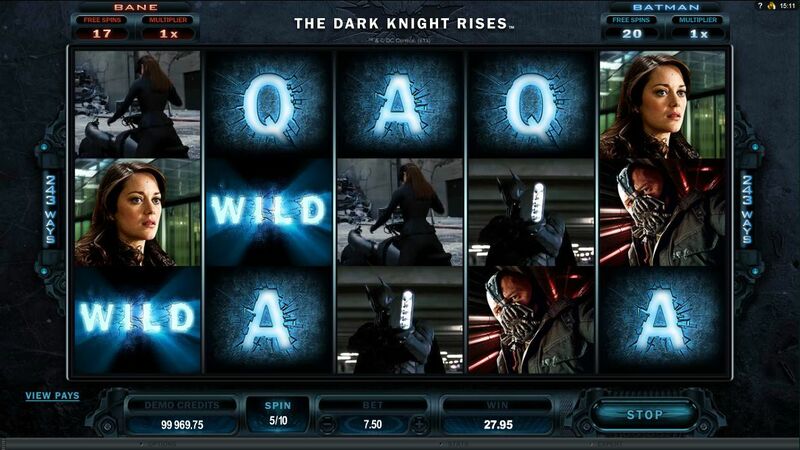 The Dark Knight Rises features five reels and 243 paylines, which is pretty high but not uncommon in Microgaming slots. In terms of features, this slot has plenty, however they take some time to get into their own. 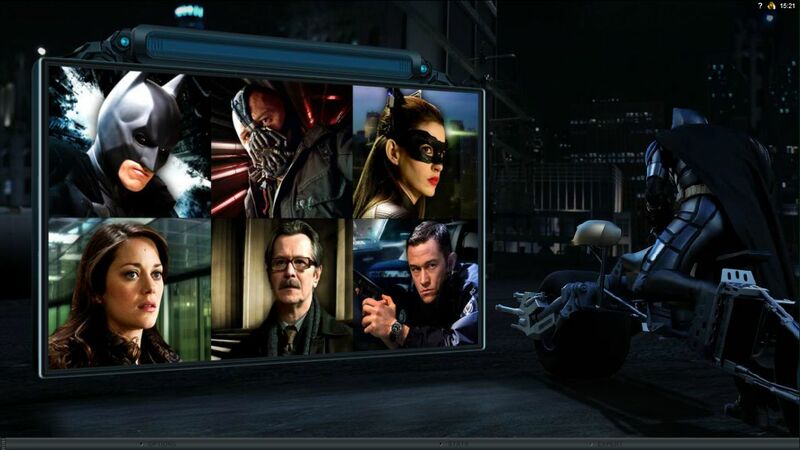 The Dark Knight Rises isn’t your “quick fix” slot by any means. If you want to win big, you’ll need to spend quite a bit of time with this game, but in the end it will be more than worth the wait. For this reason, taking this slot with you on the go might be a good idea - which is possible thanks to the mobile release. The betting range is pretty low, which is another reason that one must take their time when playing this slot. Ranging from 0.30 to 7.50, the betting range doesn’t exactly accommodate you high rollers out there. 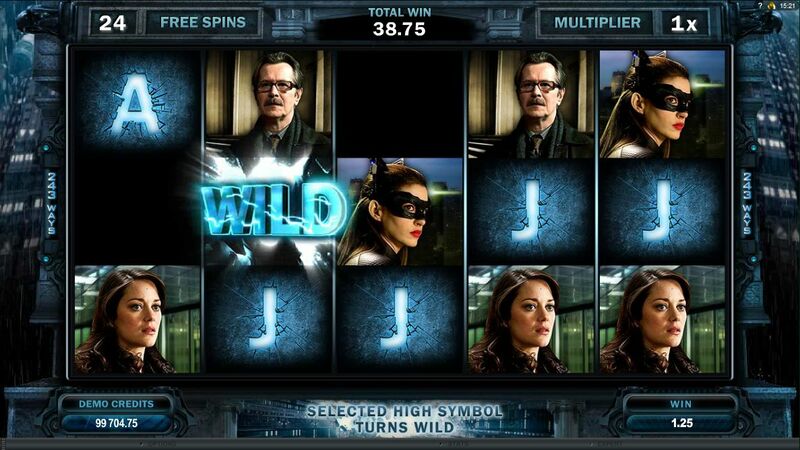 One of the more enticing features of The Dark Knight Rises is the random jackpot with four variants. The two smaller ones are fairly frequent, but aren’t exactly game-changers in terms of wins. On the flip side, the two larger jackpots will leave you loaded, but chances are you’ll never encounter them. These jackpots are encountered entirely at random, depending on certain symbol alignments. Many of the play features present in The Dark Knight Rises don’t do much to shake things up, however a few of them will hit you with some big wins. The wild symbols, being the Batman logo, don’t do much unfortunately - if you roll one on reel 3, it will expand across the whole reel, possibly completing some otherwise un-achieved paylines. A randomly triggered feature has been added to this slot which can save otherwise failed spins - if you’re left with no wins after a spin, there is a chance you’ll activate “Symbol Scramble” which will shuffle all the symbols possibly resulting a minor - or even major - payout. The main attraction here, like in the film, is the conflict between Bane and Batman. Occasionally, a random fight event is triggered wherein the two combatants appear on your screen and trade punches. Each hit adds a number of free spins to the Fight Meter, which will be activated once the two masked men stop whacking each other. You’ll also get some other bonuses based on how many of these free spins you accumulate. The more solid multipliers start coming your way after you hit the 25 mark, but even before that those free spins can easily rack up some bonuses. 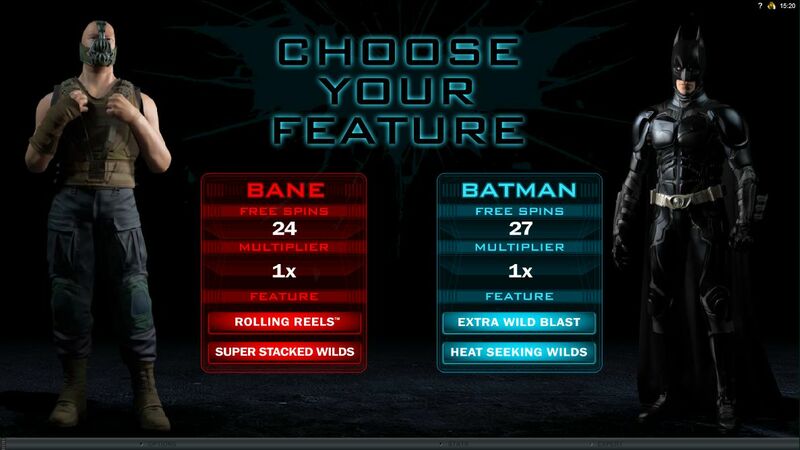 Whenever the free spins are triggered after a fight, you’ll be able to pick from one of the two main characters; Batman and Bane; each offering different bonuses. Bane will break any winning symbols, which then get replaced. Batman, on the other hand will exchange some symbols for wilds. 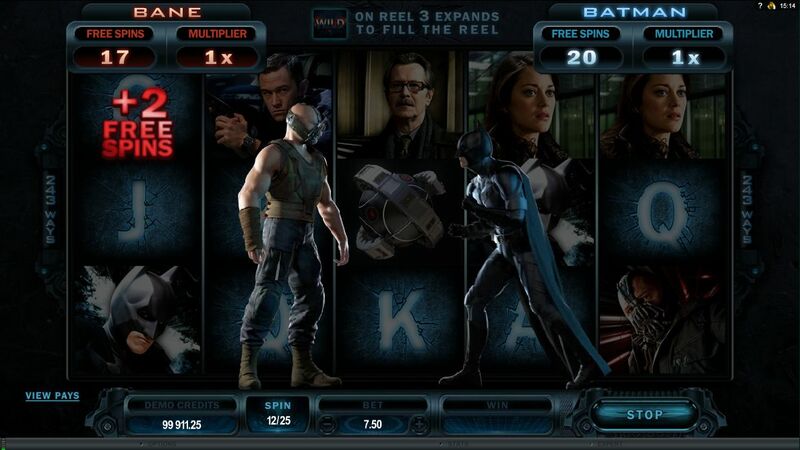 Both have the potential to secure a massive payout, but in our experience you’ll have better luck betting on Bane. The level of excitement this slot has to offer depends on how much time you’re willing to invest into it. Early on, it’s pretty slow and uneventful, which some players might find to be frustrating. However, once the action picks up and you’re racking up those free spin multipliers, you’ll find yourself on the edge of your seat - if you last that long. 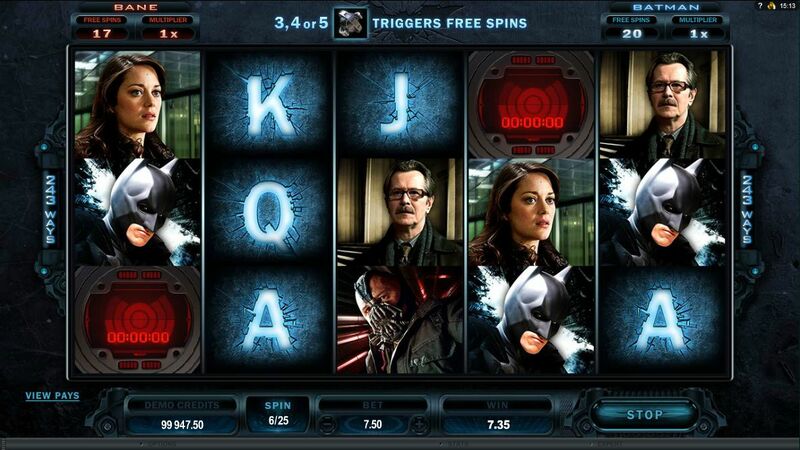 The Dark Knight Rises is a potentially fun and rewarding slot that just needs some time to come into its own. Its basic features aren’t anything to write home about, but the free spins can leave you with massive multiples of your original bet if you’re patient.